Banchan is traditionally made days in advance and it’s incorporated into every Korean meal. It's fun to make these small side dishes ahead of time and then add a side of rice or an easy soup recipe throughout the week and plan your meals efficiently. 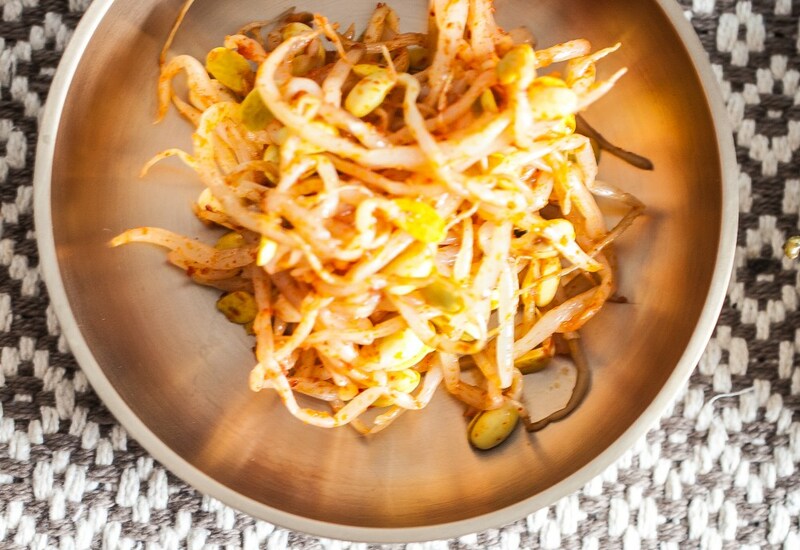 Here all you have to do is combine soybean sprouts with spicy gochugaru, rice wine vinegar and salt. The dish is ready to enjoy in minutes! You can purchase Korean ingredients such as gochugaru in Asian and Korean markets and in online stores. Make this side dishs ahead of time and store in Tupperware to enjoy throughout the week! Per Serving: 5 calories; 0g fat; 0.3g carbohydrates; 1g protein; 0mg cholesterol; 133mg sodium. I made this and used the leftovers as an ingredient in another entree the following day with white rice and other side dishes I had accumulated. I made 3 banchan side dishes in under an hour! Winner for me!